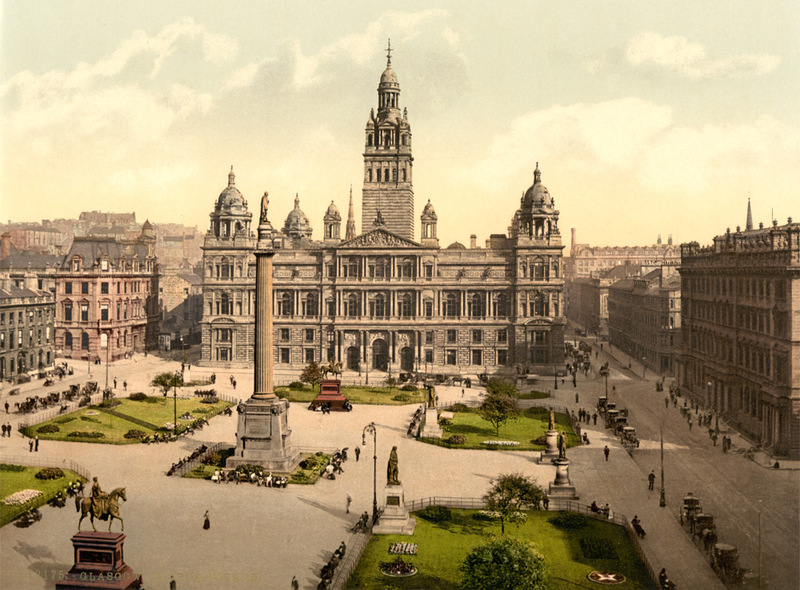 Probably the thing which most stirs people over the proposed George Square demolition is the obvious glee of our councillors to get rid of the statues of the "irrelevent" Victorian heroes their predecessors revered. William Ewart Gladstone were, except that they were not parasitic Labour apparatchiks who took hundreds of millions of £s from us fraudulently, like Dewar, whose statue will continue to brood over the serfs. 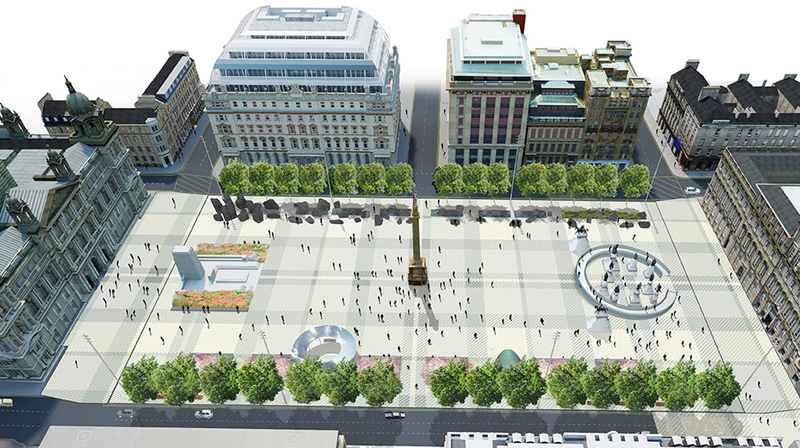 This is how George Square was intended to look. Now I am not normally an opponent of change, for example I went on the record to support the proposal to build a glass bridge between the towers of the Kelvin Art gallery (#7 here) - something which the Council decided would be insufficiently Victorian looking. However not only would that have looked completely spectacular, particularly for those crossing it, it would have been something original, at least in the UK, classy and pushing the technological envelope. None of which can be said for any of the official choices here. I think this one, #5, is the best of the 6 but it is pretty dreadful - even with all the faked perspective. The only new idea there is closing the end roads, which would gardly reduce congestion. This is more like the "iconic footbidge" nonsense. Does anybody doubt that if that is put in place we will not acknowledging how much it looks like 1,000 other places worldwide. Remember the 1960s DIY programme which showed you how to turn ann old fashioned Victorian door into a modern vision of loveliness by nailing a couple of pieces of chipboard on them to obscure the detail. If we want technical innovation go for what is being called Option 7 - put it back the way it used to be without all the current orange tarmac - and then add some grass reinforcing matting - something not available to the Victorians but which would protect the grass, without being intrusive, and let people make even better use of it. After all if Glasgow is "the Dear Green Place" would greenery not be a good idea. And that would cost thousands (at least if put out to commercial tender rather than done in house) instead of the £15 million (and counting) the Council promise for their scheme. This is the Sky City One, intended to take 3 MONTHS to build (& much longer to get permission) in China. Construction is expected to begin early this year of Broad's 220-story Sky City in Changsha, in Central China's Hunan province. 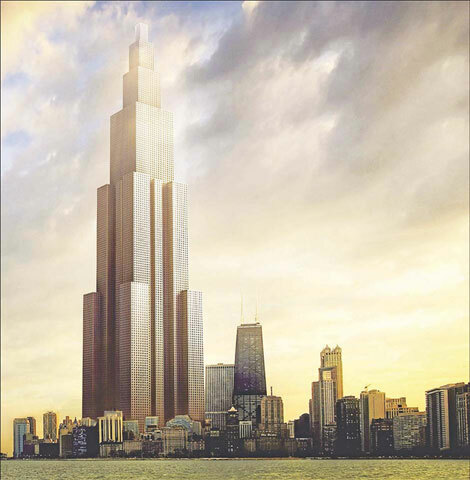 Once completed, it will rise 10 meters higher - at 838 meters (2,749 feet) - than the Burj Khalifa in Dubai, currently the world's tallest building. Sky City's construction cost is estimated at $620 million; the Burj Khalifa, completed in 2010, took five years to build at a cost of $1.5 billion. $620 million is £400 million, just under the cost of the Scottish Parliament building, or about 75% of we take account of inflation. nearly 83% will be for residential purposes, housing up to 17,000 people. 5% will be for the hotel housing 1000, while 3% each will be dedicated to schools, hospitals, offices and shops." The further development is that Broad intend to build such structures around the world. "The idea is to set up franchises anywhere such as the United States, using the techniques of making sustainable prefabricated construction materials," Wang said from Broad USA's headquarters in Hackensack, New Jersey. Their role in Britain seems to be currently limited to membership of the Climate Group, a building lobby organisation committed to global warming alarmism. Broad's owner claims to believe in this nonsence and he may even be telling the truth but supporting such lobbysists is a good way of getting a foot in the door. It is therefore clear that they are intending to build here if they are allowed to. At £19,500 per occupant for the 83% of the building that is residential they would certainly be able to provide all the housing all out politicians say they want. On fact i suspect that if they don't want to build the world's equal tallest building again and again but simply fo the first level of the 5 levels shown costs would be spectacularly lower. "Setting out the budget to Parliament, Finance Secretary John Swinney pledged £180 million over two years for construction, skills and employment and a green economic stimulus. He also confirmed more rapid delivery of the Schools for the Future programme worth £80 million." No mention of how many houses that will build, or how many schools. My guess is very few. My certainty is that if the politicians had really wanted houses they would not have to put a penny into subsidising it. They would only have to allow mass prefabrication techniques, like Broad's to work here years ago. Cameron's Speech - If He Promises An EU Referendum - Bit Only After He Is Gone? Favid Cameron is about to give a, heavily pre-leaked, speech in which he makes a cast iron promise of a referendum on EU membership as soon as possible. As soon as possible being 2018, following 5 years of renegotiation,. If the people vote to quit there would then be an unspecified, but quite likely as long as 5 years, period of disentangling. Of course right now it looks unlikely that Cameron will have any role in government in 2018, let alone around 2023. But, he is going to insist, this is as fast as it can be done. Lets look at something that sets a different precedent. Croatia - In the Croatian independence referendum held on 2 May 1991, 93.24% voted for independence. On 19 May 1991, the second round of the referendum on the structure of the Yugoslav federation was held in Croatia. The phrasing of the question did not explicitly inquire as to whether one was in favor of secession or not. The referendum asked the voter if he or she was in favor of Croatia being "able to enter into an alliance of sovereign states with other republics (in accordance with the proposal of the republics of Croatia and Slovenia for solving the state crisis in the SFRY)?". 83.56% of the voters turned out, with Croatian Serbs largely boycotting the referendum. Of these, 94.17% (78.69% of the total voting population) voted "in favor" of the proposal, while 1.2% of those who voted were "opposed". Finally, the independence of Croatia was declared on 25 June 1991. Promises of EU "recognition" and eventual membership undoubtedly encouraged all of them to go for secession. Indeed Bosnia was virtually dregooned into it by a promise of such support plus a warning that it would not be available if they didn't ttake this once time only today offer. So 13 months from the elections in S and C to the declaration of independence, another 6 months for EU recognition. Even more spectacularly - 6 months in S, 1 months in C & 2 days in B&H between the referendum and independence declared. Note that this was not in a confederation of sovereign states, as the EU is, but a union forming 1 sovereugn state, internationally trcognised as a UN member and to which all EU members had undertaken in the Helsinki Treaty, to "take no action against the territorial integrity or unity" of. Legally a far far stronger union than the EU. So anybody who says the EU referendum has to be delayed for more than 6 months from now or that separation could not come about within a month, even within 2 days, thereafter is clealry not to be trusted to tell the truth on any other subject either. The other topic has to do with tritium release. I was doing projections of a hypothetical all-fusion future war (G-d protect!) but suppose it happened using devices that had zero fission content, say microdiode triggered D-T fusion triggering D-D (say deuterated plastic, the carbon being there to immobilize the deuterium) This is way beyond the state of the art today but trivial in 100 years. read that whole thing I wrote in June, interesting statistics are that 2394 devices have been detonated so far, more than an Orion's worth etc. In terms of heavy metals fallout, it should be nil (unless you count activated products from groundbursts) but in case of beta inhalation being a major issue-- could be catastrophic. As I say in the June article, the equivalent of 14976 Nagasaki sized (21 kiloton) bombs in fission and as much separate fusion happened. Theoretically if India and Pakistan or China or some combo got going and was determined to stay within past experience that is still a huge nuclear war with A-bomb sized explosions. So I don't see the deterrent effect being that formidable to future statesmen. The sweep of future history gives us all pause. Let's hope for sweeping gains, not a brr-- clean sweep. One thing is sure, we already live in a world where 300 megatons of fusion has been released, mostly to the atmosphere. But to what health effect? I looked up the research on the St George cluster and they said that with "radioactive fallout (1951 through 1962) from atmospheric nuclear detonations at the Nevada Test Site (NTS) were followed by smaller exposures (1962 through 1979)" they got "There were 109 more cases of cancer than expected (288[observed]/179[expected])". That is certainly a significant statistical effect, from many years of exposure to quite high bursts of radiation. On the other hand by definition this case has been self selected precisely because they have a higher cancer rate then normal. - in this case 60% above normal. I don't know enough statistics to calculate what the odds of something being 60% above average in those sort of numbers for events which take place in an entirely random manner as atomic collisions, by definition, do. However I suspect that it is not that improbable. And am certain that if some other community were found to have a comparable lack of cancers in its community (111 observed, 179 expected) we would never have heard of it. Another effect is that part of the reason we see more tumours nowadays is that more doctors are looking for them. There have always been benign tumours which disappeared of their own accord and in the days before doctors looked for them they rarely found them. I would assume that in St George they were always on the lookout. The abstract doesn't say what the death rates were compared with expectations. Also in terms of the effects of a major nuclear war these figures would slightly increase overall death rates but not to the civilisation ending level, Compare with the 1 year increase in life expectancy for every 4 that passes. This is 1/7,000 excess cancers - if they all resulted in death this would be shortening life expectancy by about 4 days. On the other hand there is no implicit reason to believe that Alpha, Beta and Gamma radiation will all have the same dangers - this has simply benn the assumption, as mathematically simple as the LNT theory itself, which bureaicrats have found easy to use. More genuine research on the subject would certainly be very desirable. Indeed I believe that, by providing justification for hysteria against nuclear power and thus ending the fast growth in the nuclear industry of the 1960s, this scare has done more to retard human progress than even the catastrophic warming fraud. And not merely because it has lasted longer. For some time now I have been collating news from around the world on the evidence against the Linear No Threshold theory here. I did originally intend to also list evidence for it but, despite diligent searching, neither I, nor any anti-nuclear campaigner, could find any. Nuclear costs about 30% of the average of the basket of power generating systems we use (windmills, of course, pushing the average way up). During the 1970s nuclear costs went up five-fold compared to the rate of inflation – due to regulatory costs. So all combined that brings the real cost down to 6% of current levels. Thus, even assuming there has been no more expensive ratcheting since then it is reasonable to suggest that 94% of the wholesale cost of electricity is, one way or another, government regulations. It would take time to build such new capacity. It seems to take at least forever to shuffle the paper even to allow building new nuclear capacity here but China is currently rattling them out in three years, so it is certainly possible to do so. Any country that chooses to get anywhere close to that cost is going to go into an unprecedented boom. That means any country run rationally of course. After yesterday's article on the UN regulatory authority acknowledging that there was no basis for the LNT theory I sent it out as a letter to the world's press and to some other sites. As far as I am concerned, the linear damage all the way down hypothesis was disproved years ago, and the balance of evidence strongly favors the theory of hormesis. The linear damage theory says that the dose make the poison, and even a little bit of radiation damage is too much; hormesis says that a little bit of radiation can actually be good for you. It does NOT state that if a little is good more is better. But one need not accept hormesis to realize that the lowest levels of radiation don’t have much effect on large mammals. Predictably the world's mainstream media has continued censoring. For 60 years the Linear No Threshold theory (LNT), that low level radiation is harmful, has been the foundation of the anti-nuclear movement. It has never had any scientific justification whatsoever and this has now been publicly acknowledged by the The United Nations Scientific Committee on the Effects of Atomic Radiation (UNSCEAR). The fears engendered by this scare story have been directly responsible for the standstill in nuclear energy generation and thus in most energy generation overall in the world since 1970. Without that scare the world would be producing at least twice as much electricity and would thus be toughlt twice as well off. A very big report came out last month with very little fanfare. It concluded what we in nuclear science have been saying for decades – radiation doses less than about 10 rem (0.1 Sv) are no big deal. The linear no-threshold dose hypothesis (LNT) does not apply to doses less than 10 rem (0.1 Sv), which is the region encompassing background levels around the world, and is the region of most importance to nuclear energy, most medical procedures and most areas affected by accidents like Fukushima. You know, like everyone’s been doing since Chernobyl. Like everyone’s still doing with Fukushima. Finally, the world may come to its senses and not waste time on the things that aren’t hurting us and spend time on the things that are. And on the people that are in real need. Like the infrastructure and economic destruction wrought by the tsunami, like cleaning up the actual hot spots around Fukushima, like caring for the tens of thousands of Japanese living in fear of radiation levels so low that the fear itself is the only thing that is hurting them, like seriously preparing to restart their nuclear fleet and listening to the IAEA and the U.S. when we suggest improvements. UNSCEAR also found no observable health effects from last year’s nuclear accident in Fukushima. No effects. To recap LNT, the Linear No-Threshold Dose hypothesis is a supposition that all radiation is deadly and there is no dose below which harmful effects will not occur. Double the dose, double the cancers. First put forward after WWII by Hermann Muller, and adopted by the world body, including UNSCEAR, its primary use was as a Cold War bargaining chip to force cessation of nuclear weapons testing. The fear of radiation that took over the worldview was a side-effect (Did Muller Lie?). Of course, doubling the dose doesn’t double the cancers below 10 rem/yr (0.1 Sv/yr). It has no effect at all. The millions of nuclear workers that have been monitored closely for 50 years have no higher cancer mortality than the general population but have had several to ten times the average dose. People living in New Mexico and Wyoming have twice the annual dose as those in Los Angeles, but have lower cancer rates. These cannot occur if LNT were true, because LNT states this could not occur. There are no observable effects in any population group around the planet that suggest LNT is true below 10 rem/yr (0.1 Sv/yr) even in areas of the Middle East, Brazil and France where natural background doses exceed 10 rem/yr (0.1 Sv/yr). UNSCEAR is an independent body of international experts that has met regularly since 1955 and helped establish radiation as the best understood, though weakest, carcinogenic agent in the world through its studies of atomic bomb survivors, the effects of the Chernobyl accident, industrial radiological accidents, and medical radiation treatment. Accepted global limits on radioactivity levels in foods is 1000 Bq/kg (1,200 Bq/kg in the U.S.). Dominated by cesium-137 and Sr-90, these levels were set by organizations like the IAEA and UNSCEAR after decades of study. Because of public radiation fears broadcast in the press after the Fukushima accident, Japan cut the limit in half hoping it would have a calming influence. But the level of fear remained high, so Tokyo lowered the limits to one-tenth of the international standards. This was supposed to induce calm? Telling the public that radiation is even more deadly than they thought? That their food is toxic? Were they nuts? This has had the unintended (?) consequence of making people even more afraid of what they are eating, moving safe foods into the scary category and limiting food exports, causing even further economic and social damage. Suddenly, all sorts of normally safe foods are now banned. Wild mushrooms from Aomori Prefecture are now banned because they have cesium levels of about 120 Bq/kg. This cesium has nothing to do with Fukushima, it’s the same type as is in everyone’s food around the world, and it wouldn’t have rated a second look before the accident. The Japanese people should not be punished for nothing. But these new results and the UNSCEAR reports demonstrate that they are being punished. There was no reason to lower the rad limits on food, especially after the short-lived nuclides have long decayed away. One of the incorrect assumptions was that people in Japan would be eating only contaminated food, which is quite wrong. The international limits were set for very good reasons, lowering them makes no sense except to further hurt farmers and consumers in Japan. Ingestion of the short-lived isotope iodine-131, with its well-known risk of thyroid cancer when absorbed in the thyroid glands of children and young people, was the only major radiation-related health effect of the Chernobyl accident on the public. And the Soviets could have prevented that by acting quickly and openly. Of course, the Soviets didn’t much care about the public. This will not happen in Japan. Iodine-131, with a half-life of only 8 days, decayed away in a few months following the accident and no one was found to have ingested any significant amount. According to the reports, six Fukushima workers received total doses of over 0.25 Sv (25 rem) during their time fighting the emergency, while 170 workers received doses between 0.1 and 0.25 Sv (10 to 25 rem). None have shown ill effects and most likely never will. Radiation played no role in the coincidental deaths of six Fukushima workers in the time since the accident, who died from accidents, e.g., being crushed by debris or being swept out to sea. Yes, there are health effects of radiation above 0.1 Sv (10 rem) that statistically increase up to 1 Sv (100 rem) but even in this higher range it’s hard to see them without a big enough population. The only radiation events on this scale, where large populations received 0.1 Sv (10 rem) to 1 Sv (100 rem) have been the atomic bomb blasts from World War II. The effects of radiation only start to become clear at high acute absorbed doses of over 1 Sv (100 rem), and even then it is necessary to eliminate other potential causes before radiation can be unequivocally said to be the cause, advised UNSCEAR. What this means for nuclear waste disposal is even more dramatic, but more on that later! In the end, if we don’t reorient ourselves on what is true about radiation and not on the fear, we will fail the citizens of Japan, Belarus and the Ukraine, and we will continue to spend time and money on the wrong things. I’m sure the anti-nuke ideologues and conspiracy theorists will not accept these U.N. reports, but then…they don’t like the United Nations anyway. I have reprinted almost the entire Forbes article here - it is all that important. Indeed looking at the graph it seems UNSCEAR are still understating - the graph clearly shows effect predicted by the hormesis theory (that at fairly low levels radiation actually improves health) from above 2.7 mSv.